Carin asked me to share a couple of carries that can be done with a moby or stretchy wrap. The carries I’ve showed in the last two Babywearing series aren’t suitable because they are for short wraps. Stretchy wraps and woven wraps have a couple of key differences. The first being that stretchy wraps are very, very long, the second, obviously, is that the stretchy wrap is stretchy and the woven wrap does not stretch. You’d think that goes without saying, but I’m saying it anyway because as a result of this very obvious difference you must never use a stretchy wrap to back carry, only a woven wrap. 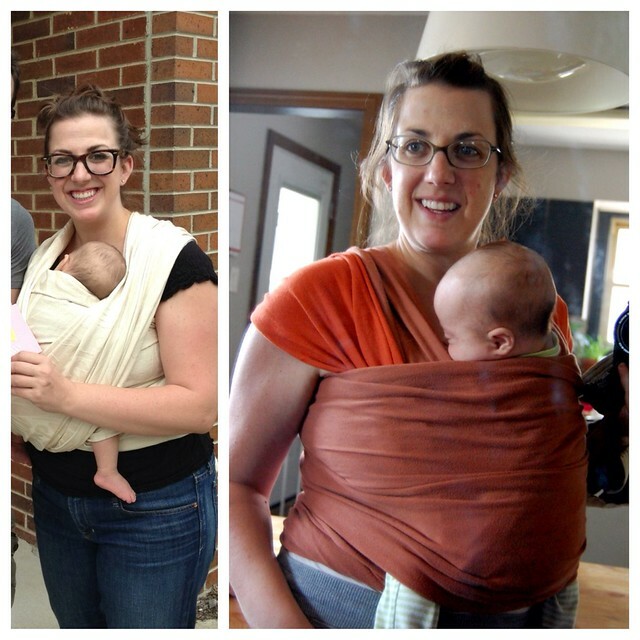 Both of the carries this week can be done with either a long woven wrap or a stretchy wrap. The carry on the left is front wrap cross carry (FWCC) and the carry on the right is a pocket wrap cross carry (PWCC).